Perimeter security is one of the many things you should be considering. Perimeters come in all shapes and circumferences. Sometimes they’re well-lit and easy to secure, but many times they are not. 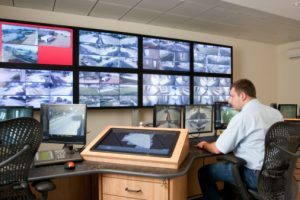 Ensuring the safety of your facility requires vigilance on all fronts, and the perimeter is one of the most important ones. Let’s take a look at how IP cameras can help you keep a secure facility. Here we go! Some types of cameras cannot perceive accurate images in varying shades of light. That means that certain points of your perimeter may go without surveillance even with ample camera coverage. When you invest in an IP camera system, you need to make sure that they are sensitive to different levels of lighting so that you can maintain surveillance at any time of day or night. To help address this issue, you can use infrared or thermal sensor technology, though they come with their own issues. Infrared technology can sometimes give you a blurry picture, making it difficult to know what exactly is breaching the perimeter. Similarly, thermal imaging can detect hot or cold things, but knowing what they are exactly can be challenging. High quality video is of the utmost importance. Knowing that something is trying to come into your facility is important, but knowing exactly what it is can often be just as important. As you think about which IP cameras you are going to invest in to maintain your perimeter security, you should keep in mind that high resolution video is going to be doing the most good. For example, not only will you have detailed visual information on what is coming your way, you will also be able to run more accurate analytics of your data. Things like facial recognition and body detection can be difficult to qualify when your data is blurry or otherwise compromised. For the most accurate picture, consider HD IP cameras. Cameras with 4k capabilities are also a fine option, but they tend to have difficulty with low lighting. Optimize your perimeter security with help from ARK Systems! This entry was posted on Friday, August 12th, 2016 at 7:27 pm. Both comments and pings are currently closed.